You are here: Home / Best Practice / What is the Best System Development Methodology? 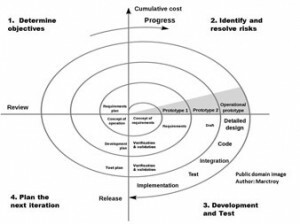 What is the Best System Development Methodology? It never ceases to amaze me, that after almost 3 centuries since the dawning of the first industrial revolution, there are many highly educated IT professionals who believe that their can even be a single, best system development methodology. The question dumbfounds me, but doesn’t surprise me. This one insists that Spiral is the way, that one, agile, and yet another, the Vee-Model to which I query, “German or American?” That surprises people almost to the extent of my astonishment when asked in a California restaurant, “Still or sparkling,” when I ordered a bottle of water. Next time I eat in California, I’ll be prepared. “…it doesn’t matter which process you adopt as long as it is adaptable, extensible, and capable of absorbing good ideas, even if they arise from other processes. These thoughts capture my philosophy completely. The Ultimate Guide to the SDLC captures the very best of the best practices recognized by leading industrial nations and some of the most well-known IT thought leaders from the latter half of the 20th and 21stcenturies. It defines a best in breed SDLC model that provides the kind of flexibility needed to drive business value in rapidly changing and competitive environments.